Thank goodness our parks aren't as well maintained as our shopping malls. The meat at the park is just fine. Well - almost. 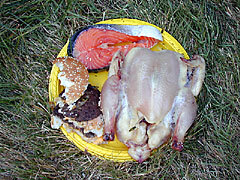 The chicken looks as if it has a slight glaze, and the salmon is still oddly undisturbed. My burger, meanwhile, has been raped and pillaged. I never had to deal with bees in the first project. This time - they are everywhere. Swarming, buzzing, and ripping off chunks of burger 2 times their size. 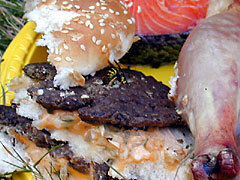 I can't believe bees could have done all the burger damage, however. 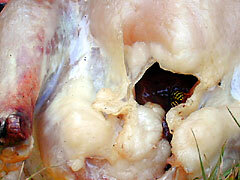 Come to think of it, I never knew bees were carnivorous. There still is no real issue with scent at this point. I believe the number of senses the meat offends will steadily increase. The ants are back, and having a party in a chicken armpit. So far, there is no sign of decomposition due to them. They just seem to be hanging out, as if stunned by their good fortune. This chicken closeup is already far too horrible to discuss. Kudos to the above bee, who has a threshold for the revolting far beyond anything I dare to imagine. It's clear that I will have to come up with some security measures to keep my meaty investment intact, after what happened to the mall meat. Tomorrow I'll place a deterrent out there. Suggestions are welcome, either by email, or via the message board.